MC4 Extension Cables have newer, snap-together multi-contact hard plastic connectors on each end. You can use these output cables between PV arrays with multi-contact cable outputs and junction boxes or grid-tie inverters. 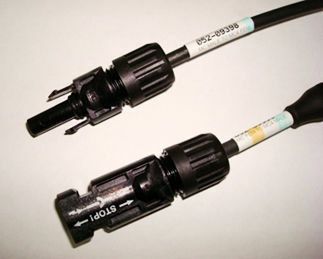 Our MC4 cables have a male connector on one end and a female connector on the other end. You can use them to extend module output cables or you can cut anywhere along the wire to obtain the needed length of male and female cable to run from the ends of a module string to a combiner box or to an inverter. For example, if you need a 30’ male and a 20’ female, order a 50’ cable. Made with black #10 AWG USE-2 sunlight resistant cable. Looking for Bulk MC4 Cable? For bulk inquiries and custom cable orders give us a call today at 1-800-472-1142.